Pioneers in the industry, we offer aluminum mirror finish mini regular sauce pan, aluminum mirror finish tapper sauce pan, aluminium mirror finish milk pan, aluminium mirror finish mini milk pan and aluminum mirror finish regular sauce pan from India. We are successfully ranked amongst the topnotch entity offering a wide range of Tapper Sauce Pan. This pan is demanded exclusively from eateries, restaurants, parties and hotels. The offered pan is comprised of a handle for better stability and grip. Also, this is efficient in boiling water, tea and other liquid beverages due to aluminum finish. In addition, clients can avail this pan in bulk from us at reasonable rates. Leveraging on our intelligent professionals, we are presenting a wide assortment of Milk Pan. 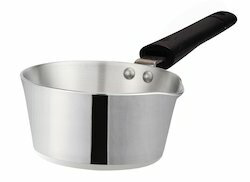 This pan is manufactured using quality aluminium grade materials. The superior finish and comfortable vessels is the eye ball of the hospitality and domestic kitchen arena. Additionally, this pan is used heavily by eateries, restaurants, parties and hotels. Clients can get the pan from us in bulk quantity at industry leading rates. With the assistance of our deft team of professionals, we are able to introduce a broad array of Mini Milk Pan. Milk pan helps in keeping the milk warm for a longer period of time. Conference, meeting and open buffet parties require such type of pan for various other things as well. At our manufacturing unit, we use quality grade aluminium and other finishing equipment for manufacturing this milk pan. Since our beginning, we are engaged in presenting a wide range of excellent quality Regular Sauce Pan. This pan is manufactured using fine aluminum materials that help the cooks serve warm food to the consumers and guests. The superior finish and attractive look catches all the eye balls towards the pan in a party. To order the pan in bulk quantity, clients can availed a cost effective deal from us. 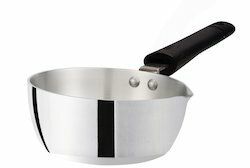 Looking for “Macclite ISI Mirror Finish Sauce Pans”?